HENRY HANNON, SR., b. October 11, 1758; d. February 23, 1835, Knoxville, Crawford, Georgia. JOHN HANNON, b. December 03, 1763. WALTER WARREN HANNON, b. May 14, 1766; d. August 29, 1838. MILDRED or AMMELA "MILLEY" HANNON, b. August 27, 1781, Maryland; February 07, 1789, Maryland. JOHN HENRY HANNON, b. September 05, 1783, Maryland; d. August 29, 1843, Macon, Bibb County, Georgia. SAMUEL HANNON, b. February 11, 1786, Maryland; m. (1)NANCY; m. (2) ANN RICE, September 11, 1809, Columbia County, Georgia. MARY LAGENLY HANNON, b. July 22, 1788, Maryland; d. August 02, 1816, Columbia County, Georgia; m. (1) WHATLEY; m. (2) ROBERT SAMUEL LAZENBERRY, May 13, 1811, Columbia County, Georgia. MILDRED or AMMELA "MILLY" ANN HANNON, b. March 28, 1791, Prince Georges County, Maryland; d. October 05, 1856, Cobb County, Georgia. WILLIAM HENDERSON HANNON, b. May 10, 1794, Prince Georges, County, Maryland; d. August 10, 1794, Prince Georges County, Maryland. 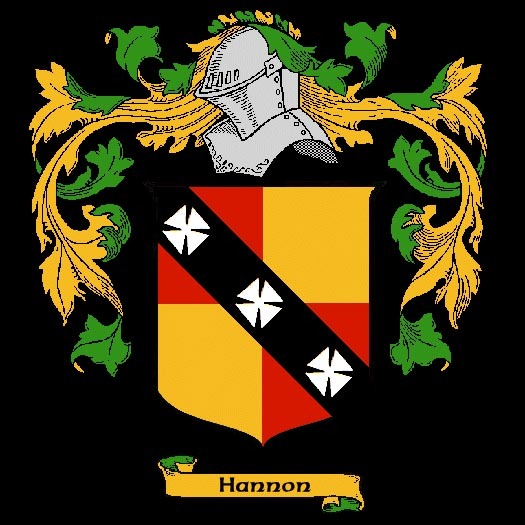 HENRY HANNON, JR., b. November 27, 1796, Prince Georges, County, Maryland; d. December 1821, Georgia. SARAH ANN HANNON, b. June 01, 1799, Prince Georges County, Maryland; d. April 24, 1850, Gordon County, Georgia. WILLILAM H. HANNON, d. Bef. 1822. WALTER WARREN HANNON, JR., b. January 30, 1795; d. May 30, 1850. GRACEY ANN HANNON, m. GERARD ROBEY. JOSEPH HANNON, m. LAURA JUDGE. SARAH ANN REBECCA BISHOP, b. June 03, 1829, Warren County, Georgia; d. Aft. 1850. MILDRED ANN BISHOP, b. February 26, 1831, Warren County, Georgia; d. August 04, 1913, Marietta, Cobb County, Georgia. HENRY H. BISHOP, b. 1833, Cobb County, Georgia; d. June 18, 1855, Georgia; m. ELVIRA CATHERINE CARLISLE, 1856, Cobb County, Georgia. JANE PORTER WALKER, b. June 24, 1822, Warren, Georgia; m. A. M. CLARK, September 24, 1845. DON FERDINAND HANNON WALKER, b. March 17, 1824, Warren, Georgia; d. October 23, 1868; m. REBECCA PITMAN, September 18, 1853. HELENA MCKENZIE WALKER, b. December 24, 1825, Warren, Georgia; d. December 30, 1879, Calhoun, Gordon, Georgia. FRANCIS DRAYTON WALKER, b. August 27, 1827, Warren, Georgia; d. October 09, 1830, Warren, Georgia. PAULINE NAPOLEON (AUNT PUG) WALKER, b. June 10, 1830, Warren, Georgia. ISABELLA VASHTI WALKER, b. October 31, 1831, Warren, Georgia; m. J. V. SPIVY. OCTAVIA ALEXANDRIA WALKER, b. July 27, 1833, Warren, Georgia; d. January 28, 1888; m. JESSY THORNBROUGH, September 05, 1868. HENRY AUGUSTUS FRANKLIN WALKER, b. June 02, 1836, Warren, Georgia; d. October 04, 1867. LUCILA GRAY WALKER, b. January 19, 1839, Warren, Georgia; d. July 07, 1840, Warren, Georgia. MARTHA ANN HANNON, m. ISAAC GIBSON MCKINLEY. WALTER HANNON, m. CYNTHIA WILLIS. SUSAN MILDRED GOODMAN, b. 1850; d. 1906; m. WILLIAM HOWLETT JOYNER. LAURA ANN GOODMAN, b. 1852; d. 1927. ROBERT BISHOP GOODMAN, b. 1857; d. 1921; m. MARIENNE "MAMIE" PORCHER ALSTON; b. 1859; d. 1891. JOHN ALLEN GOODMAN, b. 1859; d. 1916. VIRGINIUS GOODMAN, b. 1862; d. 1864. FRANCES LOUISE GOODMAN, b. 1865; d. 1939; m. CHARLES HENRY STUBINGER, SR.; b. 1869; d. 1925. WILLIAM MCDONALD GOODMAN, b. 1868; d. 1934; m. FLORENCE HASSELL HARDIN; b. 1876; d. 1958. JULIA MAY GOODMAN, b. 1871; d. 1931; m. JOHN COUPER FRASER STUBINGER, SR.; b. 1864; d. 1910. EUGENE SETZE GOODMAN, b. 1873; d. 1941. FRANCIS DRATON CONAWAY, b. September 24, 1847, Calhoun, Gordon, Georgia; d. February 10, 1848, Calhoun, Gordon, Georgia. PATRICK HENRY CONAWAY, b. April 04, 1849, Calhoun, Gordon, Georgia; d. July 19, 1933, Tyler, Smith, Texas; m. MARTHA "MATTIE" ELIZABETH ROEBUCK, December 31, 1876, Rome, Floyd, Georgia; b. October 02, 1856, Rome, Floyd, Georgia; d. November 17, 1931, Tyler, Smith, Texas. SARAH GORDON CONAWAY, b. September 18, 1852, Calhoun, Gordon, Georgia; m. G. W. GRIGGS, December 10, 1868. SUSAN ANN F. CONAWAY, b. April 15, 1855, Calhoun, Gordon, Georgia; m. WILLIAM W. GRIGGS. MARSHALL CLINT CONAWAY, b. August 31, 1858, Calhoun, Gordon, Georgia; d. June 04, 1936; m. HENRIETTA L. S. JONES, November 21, 1880. JENNIE V. CONAWAY, b. April 07, 1860, Calhoun, Gordon, Georgia; d. October 02, 1907; m. DAVID JOSHUA BAKER, January 20, 1881. ZEPHANIAH WELLS BINION, b. February 28, 1856.